In our home, music is an interest we all share. Whether it is listening to the radio or singing while cleaning the kitchen, music is always happening. You will often hear the piano as well. It varies from my daughter playing hymns to my little ones banging out their unique melodies. 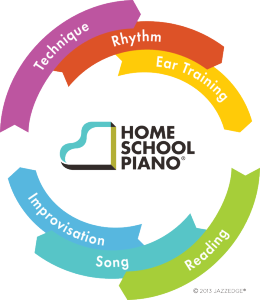 The past several weeks we have been working on building our piano skills with HomeSchoolPiano. Reviewing HomeSchoolPiano – Complete Set of Books has been a fun addition to our summer. If you are interested in piano lessons for your children (or yourself), this might be the perfect resource! 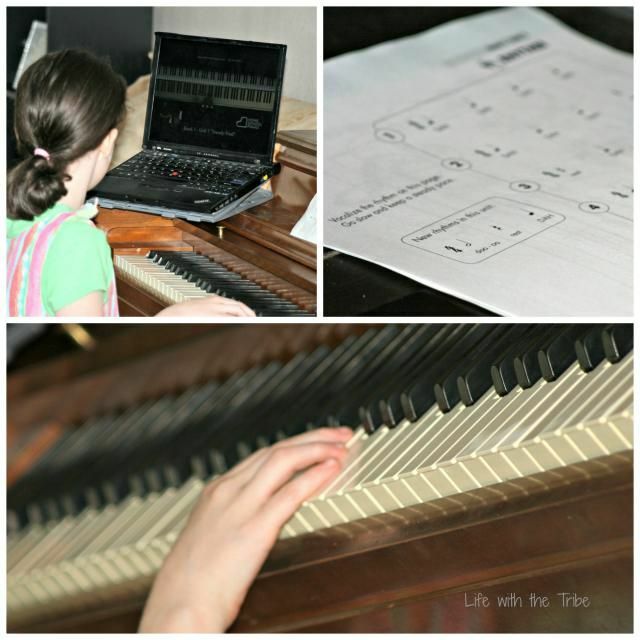 HomeSchoolPiano is an online piano instruction course for all ages. Piano teacher, Willy Myette, instructs the student throughout the four levels in this program: CorePiano, Book 1, Book 2, and Book 3. Each of these levels incorporate a six step cycle of instruction. CorePiano – This level is for beginners or those who might need a review of core piano techniques. Some of the thirty-three topics covered in CorePiano are: How to Sit at the Piano, Time Signatures, The Pedals, Chords, and Playing Hands Together. Book 1 – This the beginner level for HomeschoolPiano. There are six units and each unit includes an original piece of music.There are lesson quizzes as well. Through this level, students will learn to read music and even improvise. Book 2 – If you have a bit of experience playing the piano, Book 2 could be a good starting point. Book 2 builds on the foundation laid in Book 1. The format is the same with the six step cycle and lesson quizzes. Book 3 – At this point, you have a sturdy foundation in piano and are ready to create original piano arrangements and put to use all the skills you have learned. Once you have completed this book, you should be quite the pianist! All four levels include downloadable PDF books that provide sheet music and other resources for learning the piano. Instruction is presented in a video format. The screen shows Willie, his piano keyboard and then a virtual keyboard that lights up as Wille plays. The lessons vary from just a few minutes to around ten minutes in length. HomeSchoolPiano has recently made some updates and you can now slow the videos down. This is an excellent feature! If your student doesn’t quite catch what Willie is showing her, you can slow the video down. Willie is engaging during the lessons. He speaks in a manner that various ages can understand his instructions; he doesn’t talk over or down to his audience. One aspect of Mr. Myette’s teaching that even my youngest ones noted was to have fun. Willie encourages the student to diligently practice the technique or skill taught. However, he also tells them to play around and try out different things as well. HomeSchool Piano allows the parent to see the progress the students are making with the program. You know which lessons have been completed and how they are doing on quizzes. You can try out a free lesson! HomeSchoolPiano Complete Set of Books with unlimited lifetime membership (for up to five students and including bonuses of downloads, jam tracks, and sheet music) has two purchasing options. *One time payment of $299 or…. You will then have instant online access to the program. All you need then is a full size keyboard and a device to to view the lesson! When you figure the cost of traditional lessons for five students, HomeSchoolPiano is quite reasonable. This could be a great resource for families in a variety of situations. Missionary families living abroad, families in rural locations, or families with multiple children desiring lessons. My older daughter, 14, used this program independent of me. She decided to use the CorePiano as a review and to make sure she had a good grasp on the basics. She decided that Book 2 was a safe place to start. Mary, unfortunately, didn’t enjoy the video instruction. She feels she does better with in-person instruction. For her it is a personality/learning style issue. Mary was also concerned about how you would handle the issue of needing help if you didn’t understand a lesson. I utilized the live chat feature at HomeschoolPiano and asked this very question. If you need clarification on a lesson or concept, just email Willie. It will take a day or two to get a response, but he will offer help and guidance via email. My three other students were 10, 8, and 6. The ten and eight year olds were basically independent with this as well. I love this as I am in no way a musician! At times, I joined them for a lesson or offered technical advice. Accessing the videos is very simple and it reminds you where you stopped previously. Sarah watching a lesson while she waits for the piano. My six year old needed me to work with her a bit more closely. She is easily distracted. Her progress through the Book 1 hasn’t been as timely as the others. That is ok! We can re-watch a lesson as often as needed and progress at a rate suited to Sarah. One of our biggest challenges was balancing the time needed and scheduling. While lessons can be viewed on mobile devices, my computer was the only available viewing device. We even had a close call when one daughter forgot she was plugged into the computer via ear plugs. That piano lesson ended in a crash. Thankfully my computer and my daughter’s ears are safe and sound. HomeSchoolPiano has been great overall. If you are looking for beginner instruction or need an affordable/convenient option, take a moment to check out HomeSchoolPiano. You can learn more by visiting HomeSchoolPiano’s Blog; they have lots of helpful information there. Also check out what other Crew Families thought about HomeSchoolPiano! 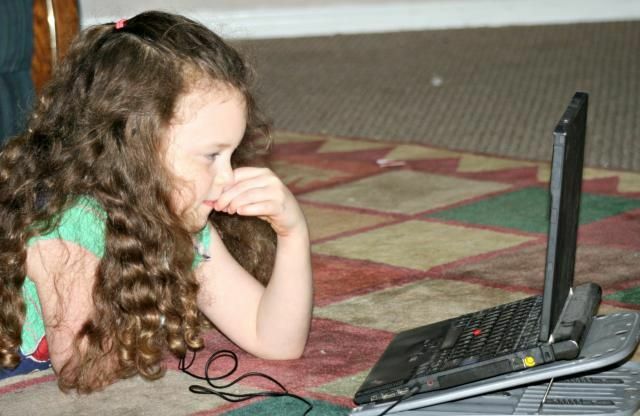 This entry was posted in Homeschool, The Tribe, TOS Crew Reviews and tagged computer, Homeschool, music, review by sweetie. Bookmark the permalink.